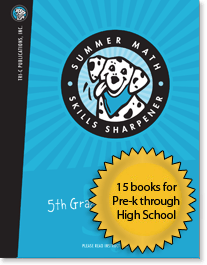 This series of 15 individual review books is designed to help students (pre-k through high school) review and strengthen their math skills over the summer without added screen time. Provides a review of the grade level just completed. Contains 30 to 35 lessons of mixed-skills practice. This means children are exposed to important concepts over and over in small doses throughout the summer for the ultimate in reinforcement. Is meant to be used 3 – 4 times per week for 10 weeks so that concepts are reinforced from the beginning of summer to the end. Because most lessons only take about 20 minutes, students can easily fit them into their busy summer schedules without added screen time. Includes tutorial help pages for students and parents to review the mechanics of each type of problem encountered in the book. An answer key is also included for grades 1-3. Solution pages are included for 4th grade and up. Supports the Common Core Curriculum and the standards of all 50 states.